Blogging software pioneer Six Apart this morning announced that it’s debuting TypePad Cloud Platform, a new service that enables developers to use the service’s API to build social applications while leaving the storage, infrastructure and organization of the data that is core to such tools to TypePad’s so-called ‘smart cloud’. Synchronously, Six Apart is introducing and open-sourcing TypePad Motion – the first application to launch on the new platform – as the phoenix rising from the ashes of Pownce (which the company picked up late last year). This is an interesting move for a number of reasons. Let’s tackle TypePad Platform first and take a look at Six Apart’s forray into the community microblogging space afterwards. The TypePad Platform will essentially enable developers to use structured social objects (think blogs, posts, comments, people, activities, groups and tags) to more easily build social applications on top of a cloud network. While this is obviously mostly a developer-oriented product, Six Apart CEO Chris Alden in a blog post wrote that this will also benefit bloggers, whether they’re part of a business or organization that uses TypePad for online publications or individual bloggers who share their life with a close circle of friends and family. For larger publishers and online businesses, Alden writes, the TypePad Platform could be another alternative for them to incorporate blogs and social networking into their websites, thus offering an alternative to local software solutions or hosted SaaS solutions. Personal bloggers will ultimately benefit from more applications that enhance TypePad’s core functionality, he expects. Starting today, interested programmers can head to the fresh TypePad Developer Program website to obtain an alpha version of the TypePad API for free, with commercial versions of the TypePad Platform set to debut later on. Time will tell if the initiative will end up creating an ecosystem of third-party developers much like rival Automattic has managed to assemble for WordPress over the years. Six Apart recently added some Posterous-style microblogging flavor and real-time blogging capabilities to TypePad, but is now switching to full throttle with the launch of TypePad Motion. The new service is the inaugural open source app built by Six Apart developers for the new TypePad platform and incorporates many of the features of the late Pownce. It’s also reminiscent of Jaiku, Tumblr and the recently introduced Yahoo Meme service. The service is already live here, so I played around with it a little and found that it was far from anything remotely spectacular in terms of functionality or wealth of features. You log on with your Typepad account and add text (no character limit, links, photos, online videos and audio) to your Motion profile. Other community members can subscribe to your new blog and comment much like any other microblogging / lifestreaming service. That’s about it, although the open-source aspect is interesting for the future. 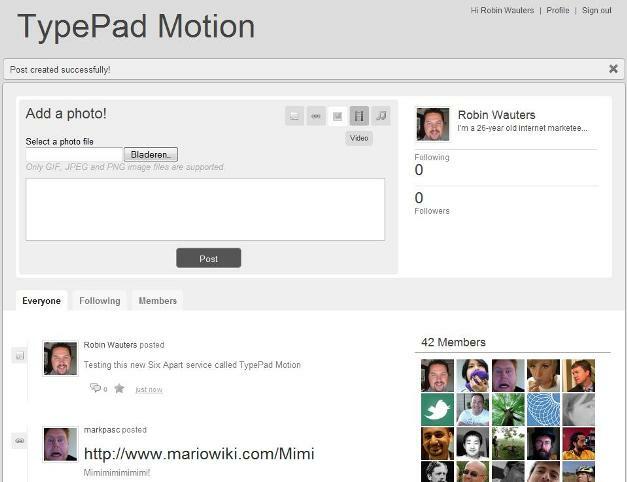 Six Apart says the TypePad Motion app evolved from the Pownce codebase & community. It’s written in Python using the Django framework (GitHub). An example of a customized Motion blog is this showcase for the Future of Web Apps conference where the above announcements were made today. A leader playing a good hand by broadening and diversifying its product line, or too little, too late? What’s your take?